DoCoMo announced that it has been pioneering research into the field of molecular communication, experiments have confirmed the feasibility of a proposed delivery system to transport specific molecules using artificially synthesized DNAs and chemically energized motor proteins, typically found in muscles and nerve cells, which are capable of moving autonomously by converting chemical energy into mechanical work. In experiments being carried out jointly with Professor Kazuo Sutoh of the Department of Life Sciences, The University of Tokyo, and Associate Professor Shoji Takeuchi of the Institute of Industrial Science, The University of Tokyo, it has successfully demonstrated the world’s first molecular delivery system for molecular communication. By combining communication technology and biochemistry, the company aims to develop systems that could transmit information about the biochemical conditions of living organisms, such as excitement, emotion, stress or disease. The system, which functions on its own because it does not require external power supply or control, could help lead to the realization of a biochemical analyzer, or biochip, a fingertip-sized microchip for biological and chemical analysis. A mobile phone with a biochip could also have applications in the fields of environment (e.g., water analysis) and entertainment (e.g., fortune telling). The envisioned molecular delivery system could have many applications in medicine and healthcare. For instance, it may be possible to diagnose diseases or stress by directly analyzing biomolecules in a drop of sweat or blood using a mobile phone equipped with a biochip. 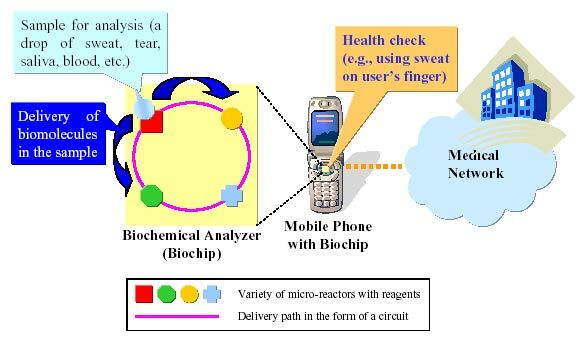 The molecular delivery system would be packaged in the biochip, and the data generated in the biochemical analysis would be transmitted to a medical specialist via a mobile phone using traditional wireless technology. The system could be used, for example, for remote health checks or preventive medicine. DoCoMo and The University of Tokyo are continuing their collaborative research into practical uses of molecular communication to identify applicable molecules and to develop an actual molecular delivery system for installation in a biochip. They have included this .pdf to further explain the research.